So I lost 14 pounds in 8 weeks recently. That’s very close to 2 pounds each week, which is a good healthy amount of weight to lose, if that’s what you’re going for. Here is my entire year’s worth of Monday morning weigh-ins. Click to see the full resolution image. You can see that I went down and then up and then down again this year. I hope to be more stable than that in 2016. And I think I might know how. The yellow highlighted section is the 8 week time period where I lost those 14 pounds. You can see that it was very nearly a straight diagonal line for the entire 8 weeks, as opposed to a whole bunch of water weight loss at the beginning with less loss at the end. 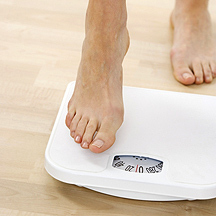 So what was my secret for this weight loss? Well, at least part of it was due to me not eating anything with wheat in it. And I also tried my hardest to avoid added or processed sugar. Here is the whole story with some excruciating details if you have some time to kill. Back in September, a person that I look up to told me about his “strange” eating habits and he also told me exactly why he took up those habits. He said that if I tried these habits the fat would just melt off me. He was not proposing a diet. He was proposing a different manner of eating. No calorie counting. No exercising. 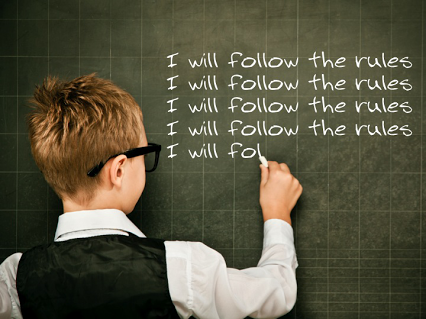 Just five simple rules. 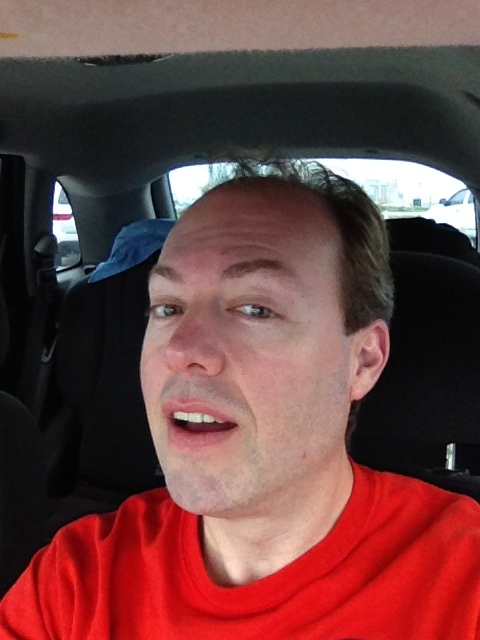 Five things to avoid … avoid like the plague. At the time I was skeptical. But not anymore. There really is something to this. So you may have noticed the huge popularity of the gluten free movement recently. Most of the gluten free camp believes that genetically modified wheat is basically slowly poisoning us all. They claim that our digestive system doesn’t fully process this wheat. They claim that it is a pro-inflammatory agent to our body’s cells. And they attribute all manner of diseases and sicknesses to the wheat and gluten in our supposedly natural and supposedly healthy diets. 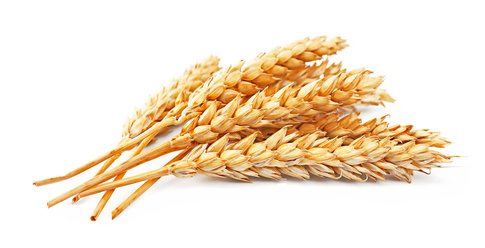 Most wheat haters also dislike barley, oats, and rye for all the same reasons. 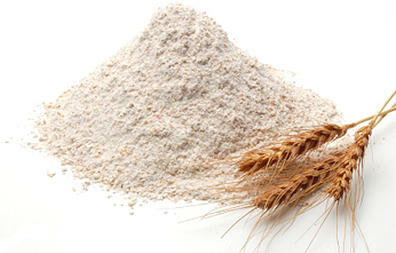 Most flours are made from wheat, but they contain very little nutritional value … even after being enriched with vitamins and minerals. So the people who are against wheat are even more aggressive in their hatred of flour. Although rice is not claimed to be as bad for us as wheat and the other grains, it is suggested by all manner of nutritionists to try and minimize it in your diet. 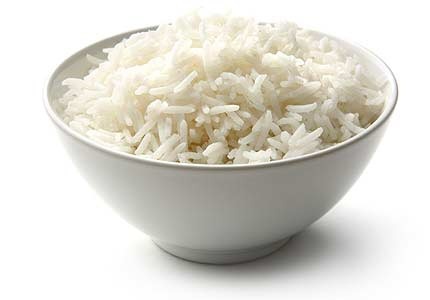 Rice … especially white rice … has very little nutritional value so filling up on it is not really going to be very good for your overall nutritional well being. Most people think corn is a vegetable, but it’s actually a grain. And yes, grains are bad for us as I explained earlier. The corn we eat today is highly genetically modified, just like the wheat. And our bodies aren’t super great at processing corn either. And everybody already knows about the high starch and sugar issue with corn. Well, sugar has always been the enemy, so that’s a no brainer. Naturally occurring sugar is probably not going to hurt us too much. But the problem is that we eat the non-naturally-occurring kind of sugar. The processed crystals that we add to almost everything. We eat a lot of processed sugar. And we drink a lot of it too. If you are addicted to sugary drinks, please please please try to wean yourself off of them. It won’t be easy. It won’t be quick. It’s a full blown addiction. You will get headaches. You will crave them. You will go into withdrawals. But if you drink one 12 ounce soda each day, you are increasing your risk of diabetes by about 25%. If you drink only one soda per week, I will not nag you about it. But if you drink several or more per week, then you are very likely causing your body harm. Many sugar haters go as far as to say that processed sugar either causes cancer or feeds it. Whether that turns out to be the case or not, you have to agree that naturally occurring sugar is probably better for your body than artificially created and processed versions. Right? No, no, no? So what CAN I actually eat? Basically grain is the enemy. Well, grain and sugar. 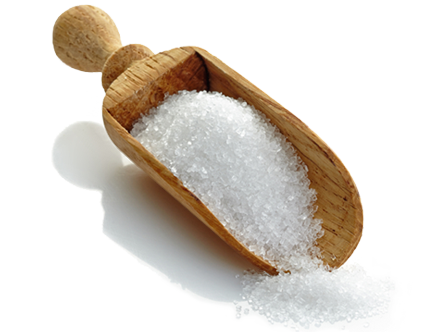 If you strictly cut off grains and added or processed sugar items from your menu, you will lose weight. Even without exercise. Fat is NOT the enemy, so don’t worry about fat free or low fat foods. Calories are not even the enemy. There is absolutely no need to count calories. Just eat a reasonable portion and then eat again when you get hungry again. Don’t eat just because it’s time to eat. Eat because you are hungry. That’s good advise for anyone. Not just people who are trying to lose weight. Eat all kinds of oils and fats without worry. Eat all manner of meats (red, poultry, pork, fish, shellfish), eggs, vegetables (fresh or frozen), leafy greens, fruits, nuts, seeds, berries, beans, legumes, oils (olive, coconut, avocado), butter, almond butter, honey, mushrooms, dairy, toppings, condiments, etc. 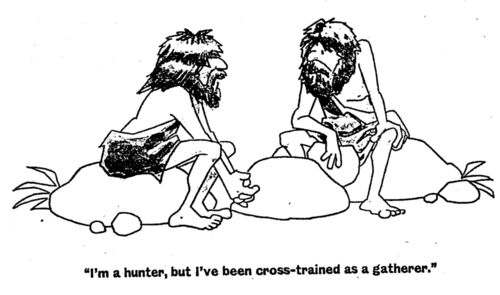 This plan is in the same vein as the “hunter/gatherer” diets that are popular, like the Paleo Diet, but not nearly as strict. For example, there is no restriction on dairy like in the strict Paleo Diet. I get it. It’s hard to avoid breads and chips. Those things are everywhere! I ate a lot of meat and cheese and mushroom omelette and scrambled egg dishes for breakfast during the 8 weeks that I was being strict and trying to lose some weight. But fruit smoothies are also a good idea or a nice change from the eggs. Flour-free banana pancakes are difficult to make without burning them, but they are a super tasty treat. Here are a handful of lunch and dinner ideas. Taco salad without the chips. Any type of salad with meat on top. Avocados on top of just about anything … salad, meat and cheese, etc. Baked or grilled fish fillet with spices or blackened. Marinated chicken breast or pork chops or steak with toppings such as mushrooms, peppers, onions, avocados, cheese, sun dried tomato, etc. Cook any meat in wine. Add jerk or blackened spices to any meat. Soups. Dips without the chips. Zucchini with lemon juice and spices. Polish sausage or brats with sauerkraut. Eat any manner of sandwich wraps and soft tacos, but eat them with a knife and fork and leave the tortilla shell behind. If you want a juicy burger, load it up with toppings and condiments and eat it with a fork and knife and leave the bun behind. Since I lost the weight that I wanted to lose and I’m now at what I believe to be my ideal weight, I’m adding in occasional suger and occasional wheat and other grains. But I will try to minimize my sugar intake and my wheat intake with the hope that I will maintain this weight over the long term. I will provide an update to this post when the jury has reached a verdict on the long term viability of this plan. Thanks for reading this article and thanks for your interest. A good reason to shave your beard … for science! I normally don’t shave my beard unless I’m in a show that requires it, but you may have noticed me sporting a clean and smooth young looking face recently. Well, this time I did it for science. 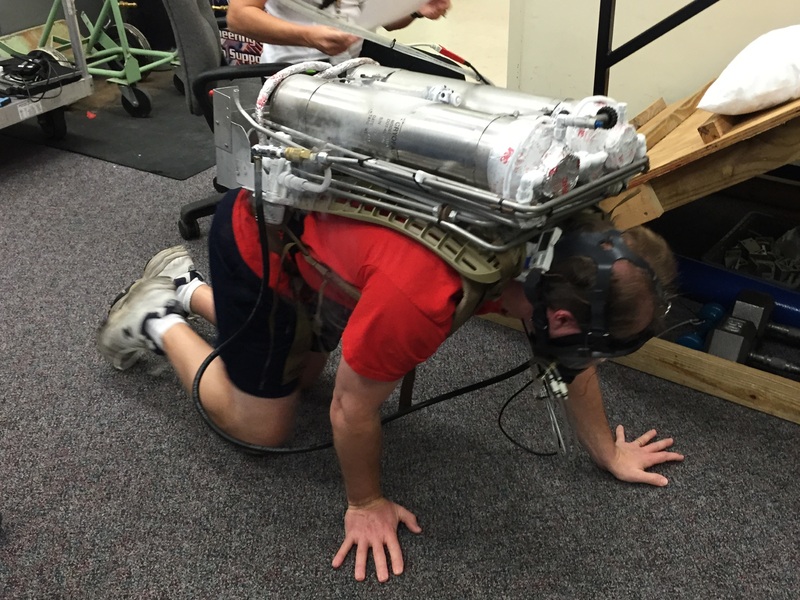 I recently volunteered to be a test subject for the medical research folks at NASA/KSC. 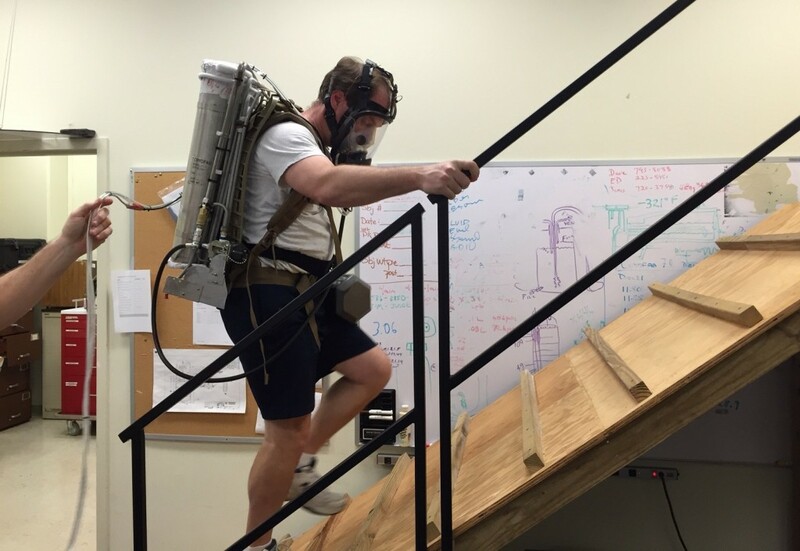 They have invented a new cryogenic or liquid air breathing pack which has been bench-top tested using a mechanical breathing machine and now they need to test it out on real live breathing machines, or human test subjects. The reason I needed to be clean shaven is that the folks running the test needed really good data, including mask pressure, so the respirator needed to make a good tight seal around my nose and mouth. 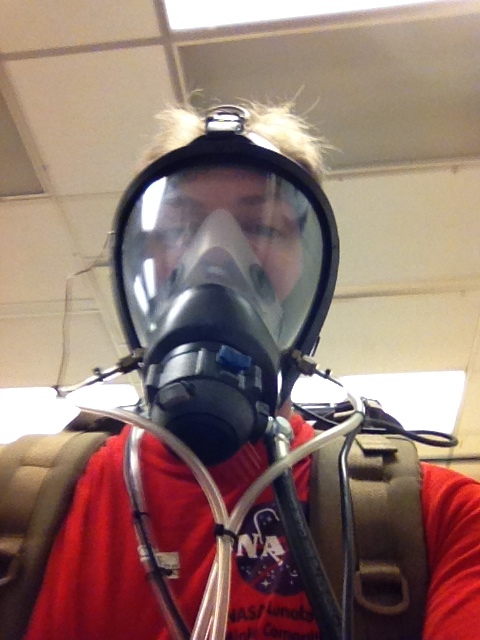 This breathing pack needed to be tested in several different situations, including crawling on the ground, laying on either side, laying on the back, walking and running on the treadmill, lifting a weight off the ground using a pulley, etc. One of the sessions even involved carrying an extra 50 pounds up a steep incline and back down several times. The breathing pack already weighed about 40 pounds, so this was pretty tiring. 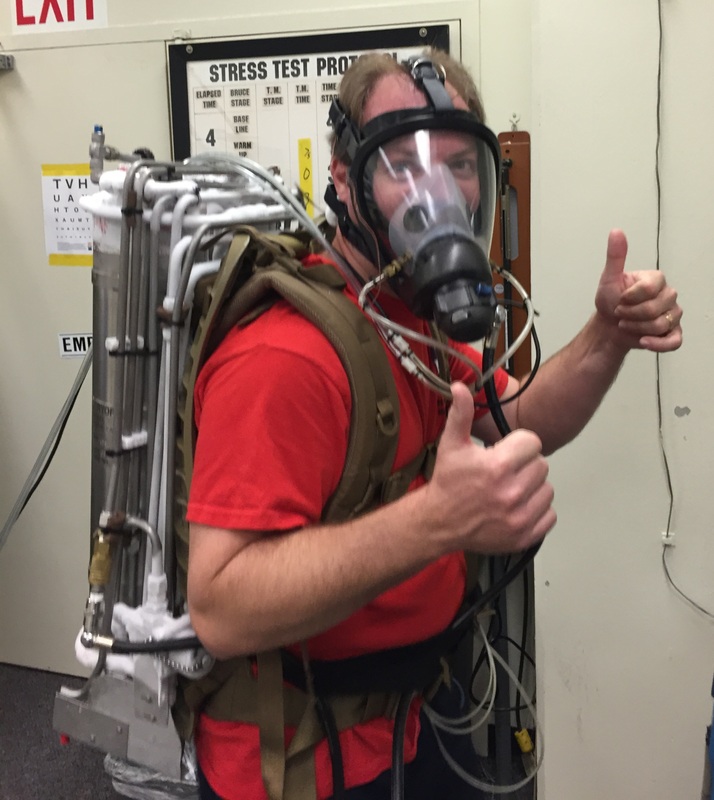 After this breathing pack is tested by several different test subjects, it could be qualified for use someday by mine workers, firefighters, rescue workers, etc. That’s NASA technology at work for you! After all, we’re about more than just launching rockets here at NASA! 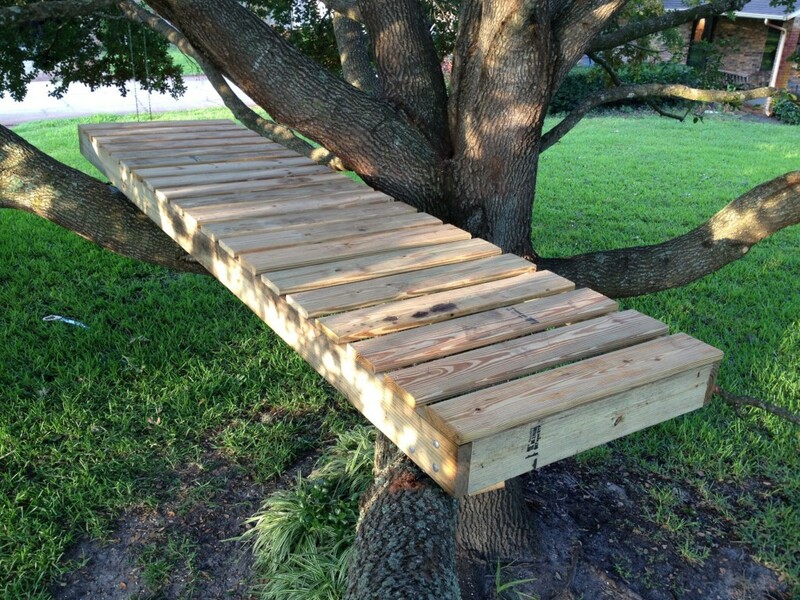 I had every intention of building a full-blown tree house on our new property, so I started with the base platform and then I was going to add other platforms and railings and ladders and such. But when the first base platform was done, I kind of liked the openness and simplicity of it. 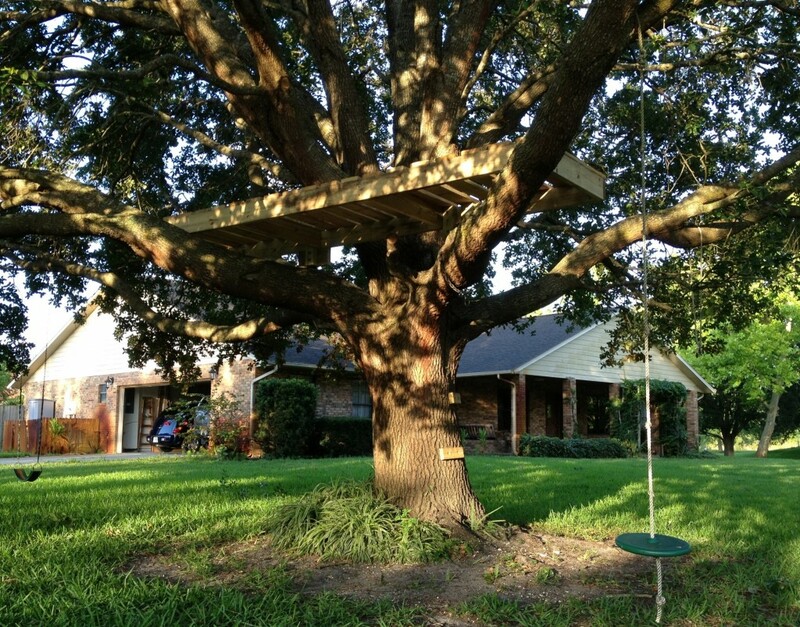 Rather than a tree house, it was sort of like a tree deck. Some readers might be wondering about the lack of railings and the potential for safety issues. That’s obviously a concern with any play structure … especially elevated ones. I find that the lack of railings makes the kids nervous enough that they don’t run around or play rough up there. Also, I made the access from the ground difficult enough that it becomes a sort of physical test that the kids have to pass before they are allowed up there. If a kid can’t climb up to the platform, which is a bit of a difficult climb, then they aren’t big enough or agile enough to be playing up there. I started out with a rough sketch. This sketch helped me figure out how much lumber to buy. 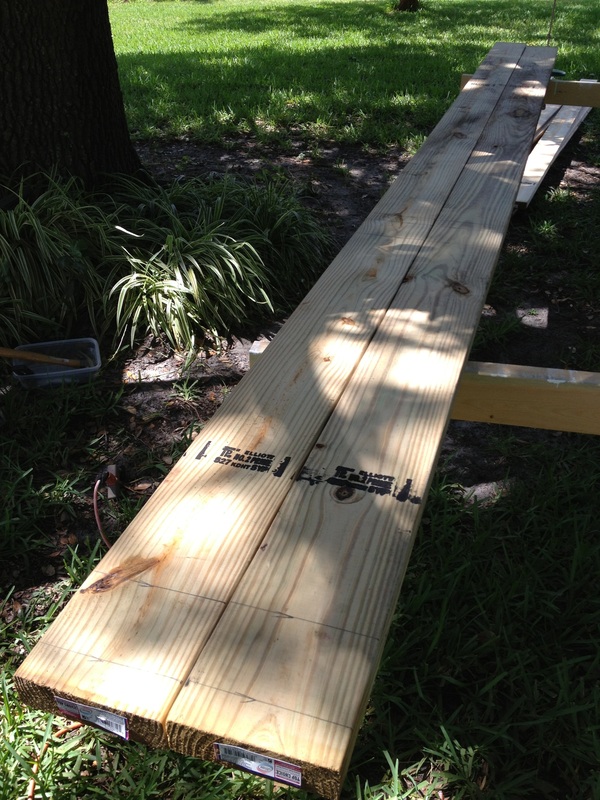 Always use treated lumber for outdoor structures. Or be prepared to paint it at least once every year. 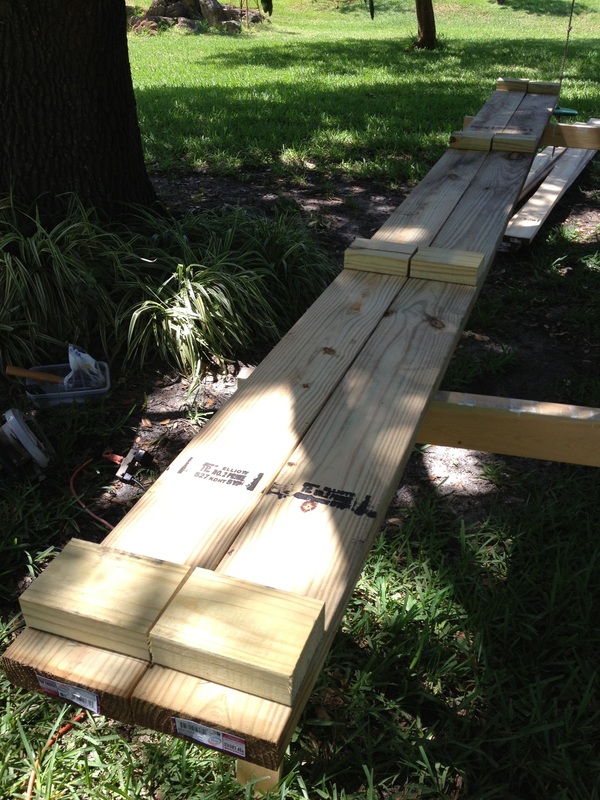 I decided to go with a 12 foot length, so these are my 12 foot long 2×6 main beams. I’ve marked on both beams where the 2×4 support blocks will be attached. This just shows the 2×4 support blocks sitting in position. These blocks are used to screw the shorter cross beams solidly to these main beams. 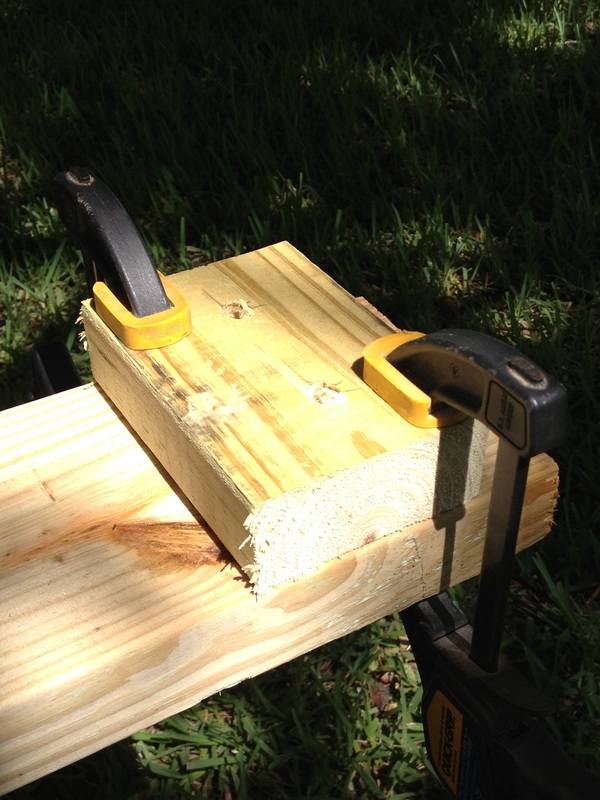 Use clamps to hold the 2×4 support blocks temporarily in place. Then mark and drill two holes for the bolts that will hold them permanently in place. The bolts, washers, nuts are all galvanized which cost more but will last a long time in the elements. I used lock washers, although I’m not sure if that’s necessary or not. So now we have the 2 main beams ready to be turned into a platform by adding the shorter cross beams. 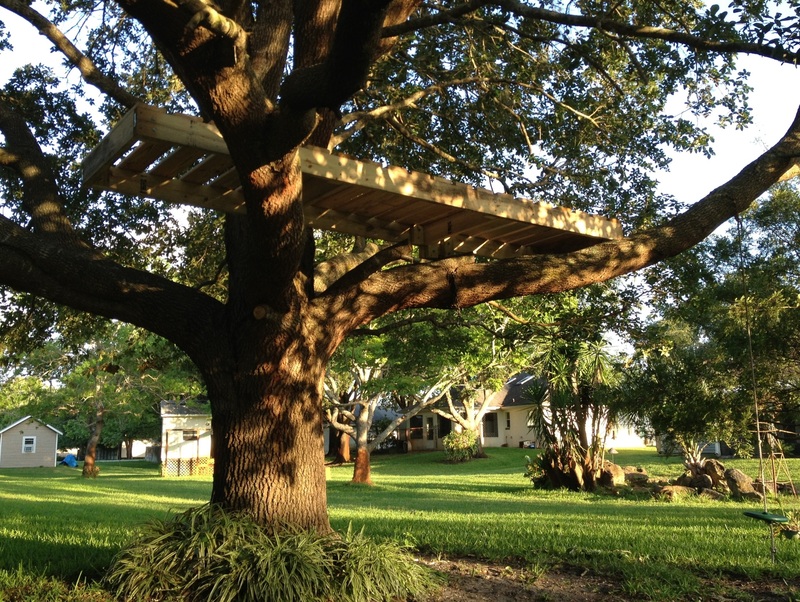 This can be done on the ground and then the entire platform can be lifted up into the tree. 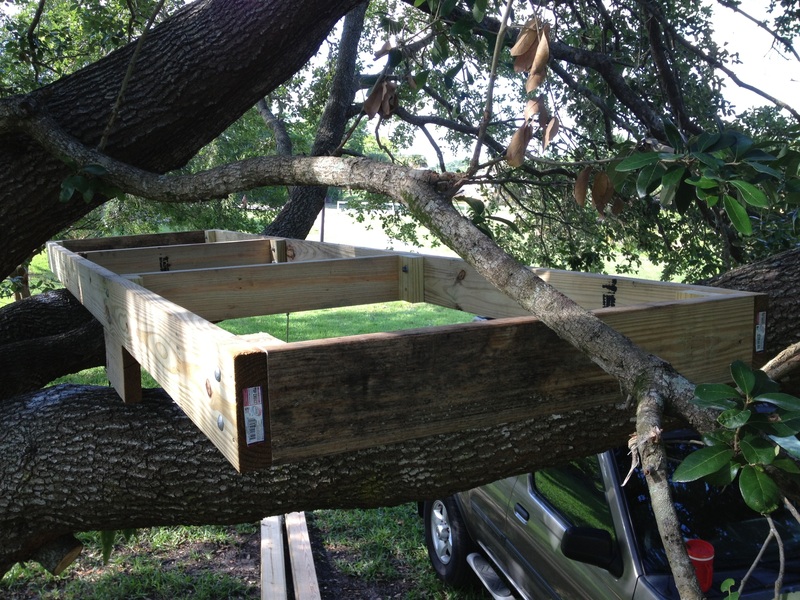 I chose to lift these 2 main beams up into their positions in the tree and then build the platform up there. The shorter cross beams are also 2×6 material. I made my platform 3 feet wide, so these cross beams are 3 inches shorter than 3 feet to account for the 1.5 inch plus 1.5 inch thickness of the main beams on either side. 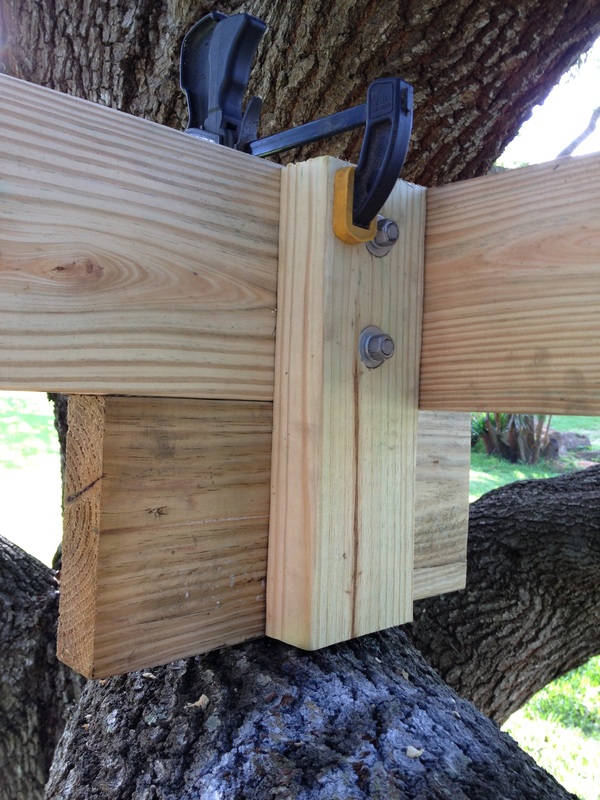 Attaching is easier on the ground, but if you clamp the cross beam to the 2×4 block (clamp not shown in picture), then you can drive some long screws to hold it permanently. I used the expensive outdoor coated screws which should last a long time in the elements. You can’t see from this photo, but I screwed the main beam to the cross beam and I also screwed the cross beam to the 2×4 block. That should hold it. 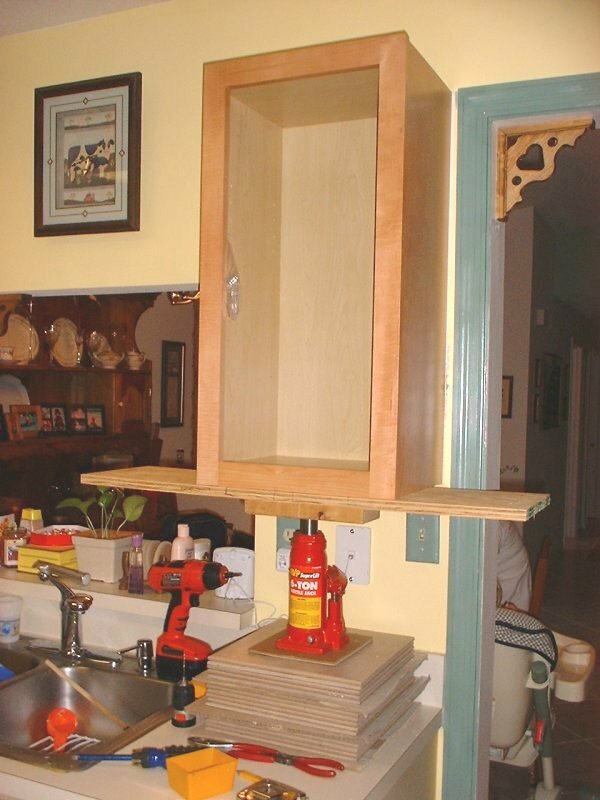 It’s a good idea to pre-drill the screw holes with a bit that is smaller diameter then the screw. 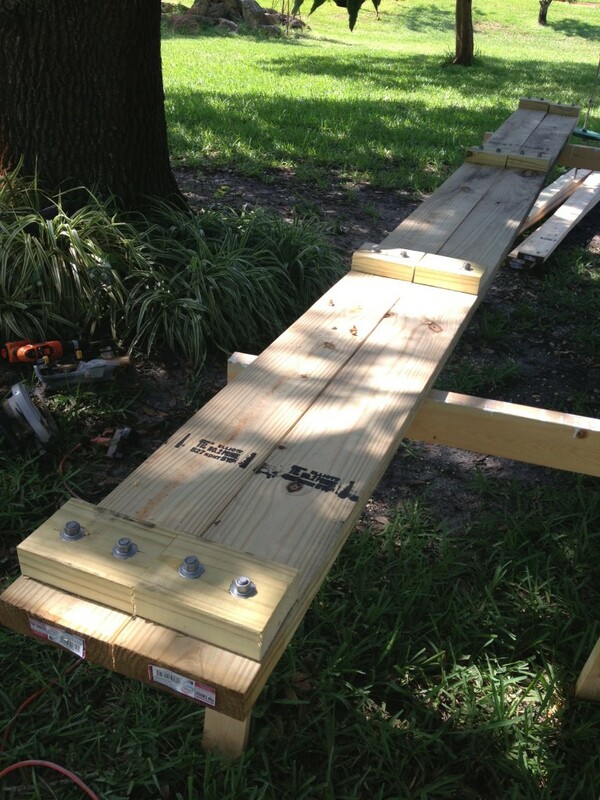 Once all the smaller cross beams are attached to the main beams, you will have a nice solid frame. Notice that I have a spacer block under the left side in the picture. Good luck finding a perfectly flat and level tree limb! I used spacers to level the platform. Here is a close up of one of the spacers before it was permanently mounted. A block of 2×6 was pretty much the height I needed. I realized at this point that I needed to replace the short 2×4 block in this area with a longer one that would span the height of both the main 2×6 beam plus the new small 2×6 block. A couple more bolts and this height extension was complete. Here is a different angle of the platform at this point. You can see that I had to create a second height extension at the other limb that was the width of a 2×4, rather than the 2×6 I used at the other limb. This second height extension is attached using two separate 2×4 blocks. 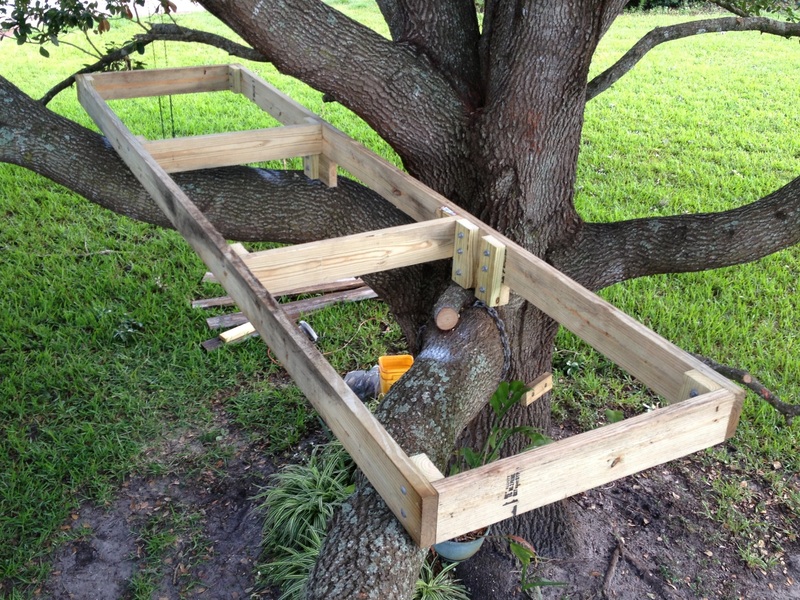 Before attaching the flooring to this frame, the platform needs to be attached to the tree so it doesn’t move or get blown away in a wind storm. 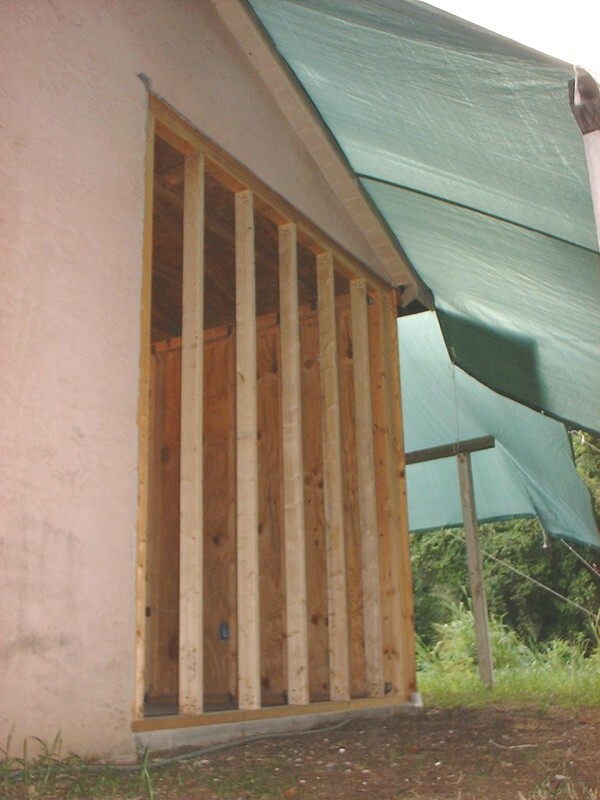 Attaching non-moving, non-growing structures to moving, growing structures can be tricky and confusing. 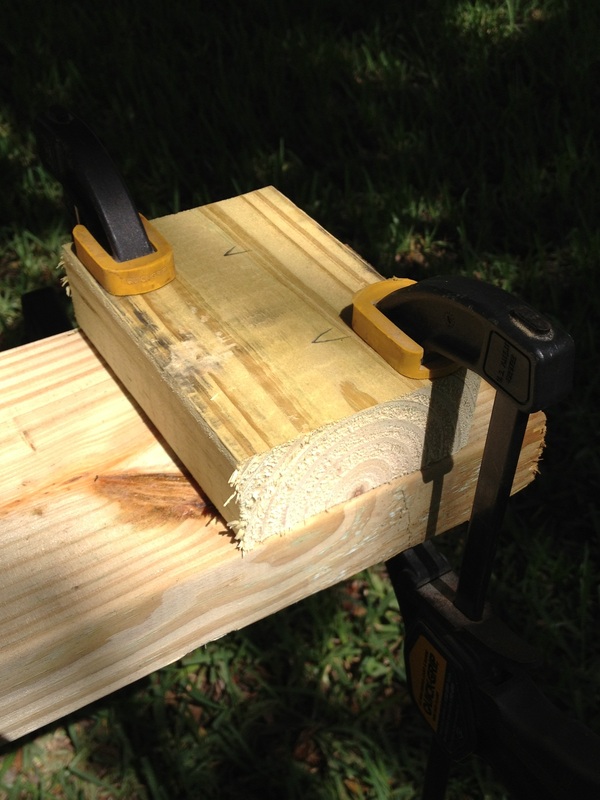 You want to avoid your lumber contacting the tree if at all possible. 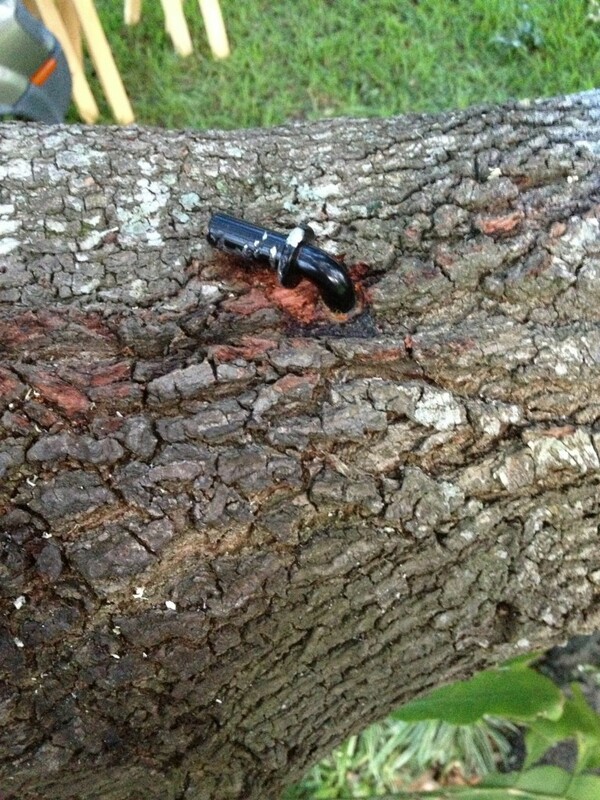 That point of contact can capture leaves and water and rotting of both your structure and of your tree can occur there. 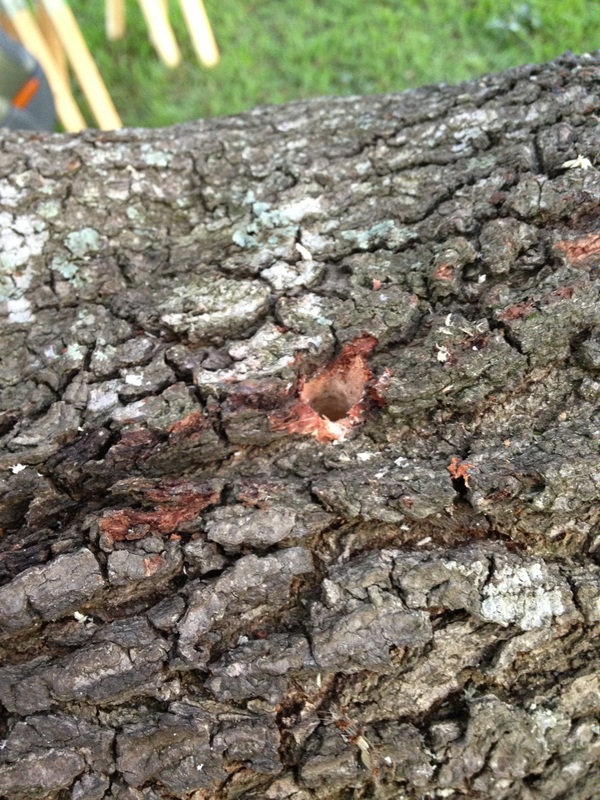 Another potential issue is binding or pinning the tree’s movement and growth. If you permanently attach or pin a structure to 2 separate tree limbs, that structure might inhibit the tree’s growth in a certain direction. Or alternatively, the tree might move or grow to a point where it stretches or warps or even breaks your structure. Not good for the tree and not good for your structure. So the trick is to mount the structure in the tree in a way that allows the tree to grow and sort of slide past the structure without it warping or breaking the structure. 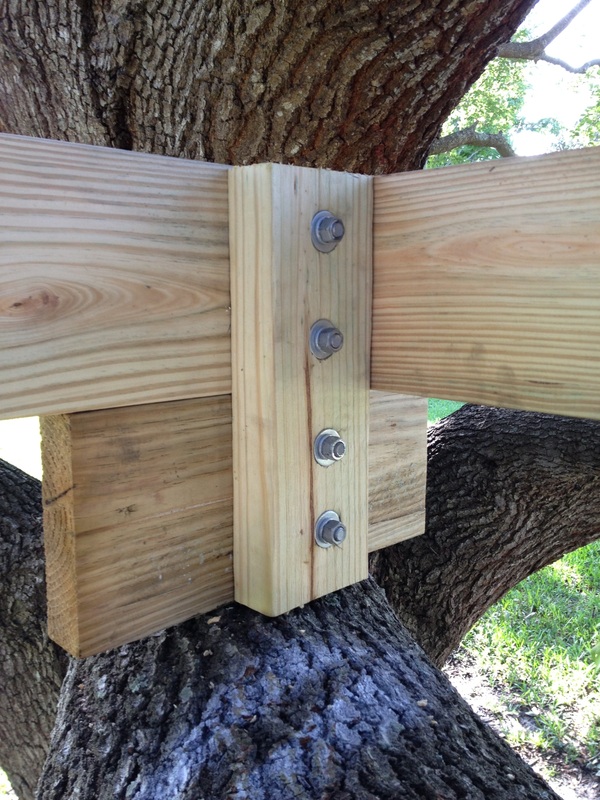 There are specialty fasteners and brackets that allow your support beam to float on top of the moving tree limb or trunk. The common phrase used in the industry is “perch, don’t pin”. I got lucky because I found a location for my platform where it was just simply sitting on top of two large horizontal limbs that could easily hold the weight of the platform. 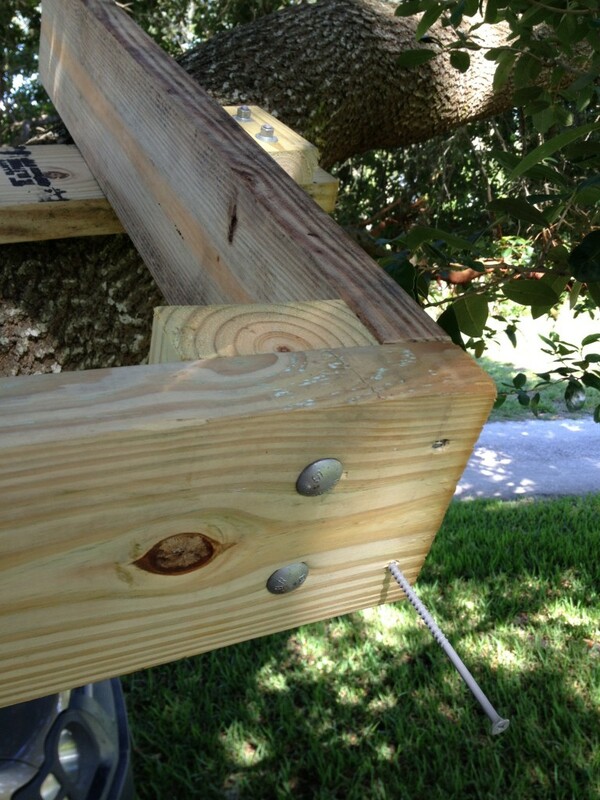 So all I really needed was to find a strong spacer of some sort to mount between the tree limb and my platform. 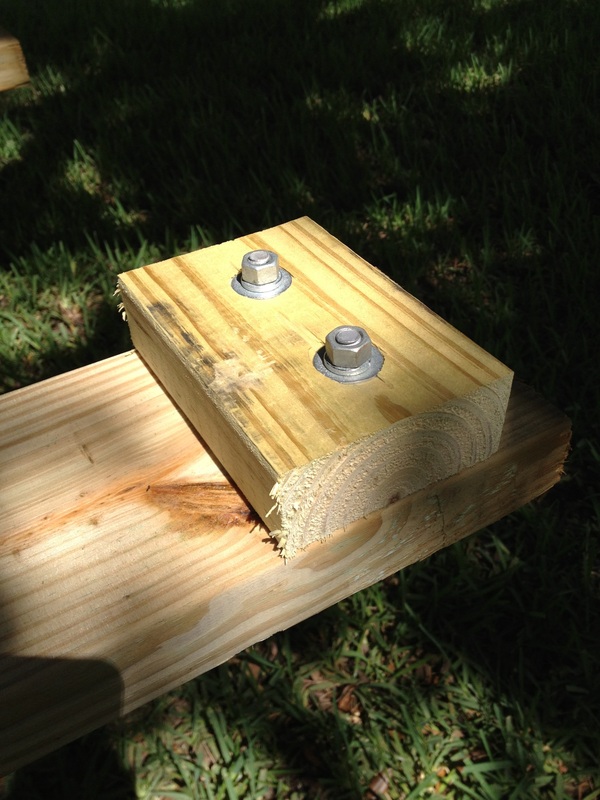 I used lag bolt gate hinges (also called pintle screws), similar to this photo and this website. 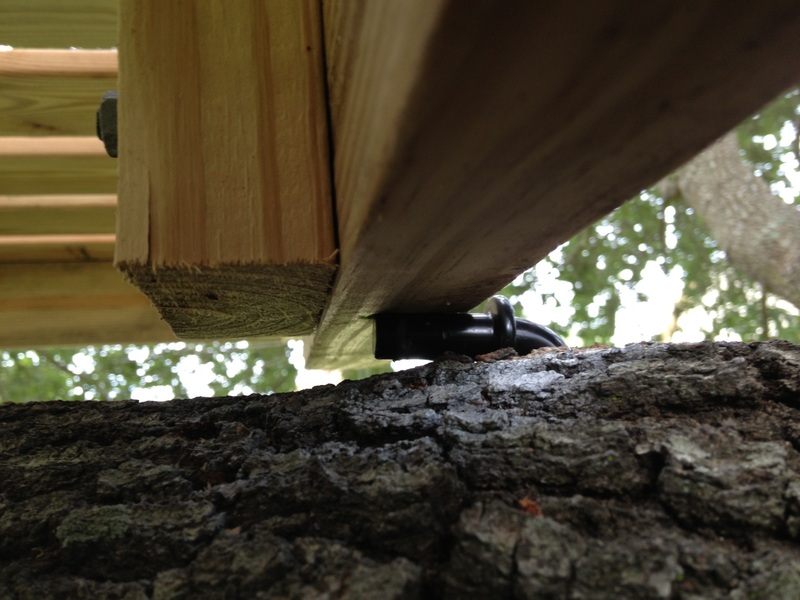 By screwing them all the way down to the limb surface, the lag bolt doesn’t actually hold up the weight of the platform … the tree limb does. 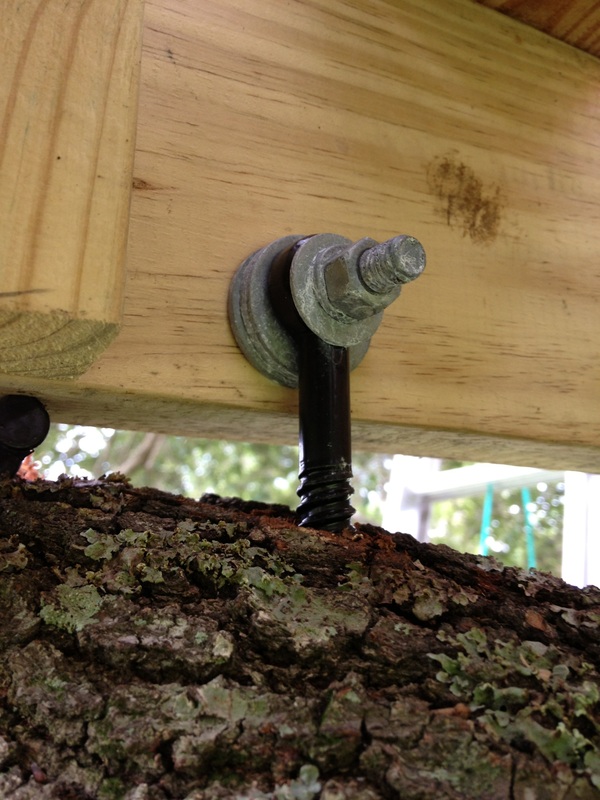 The lag bolt head just acts as a surface to separate the structure lumber and the tree while also providing a sliding surface that allows the platform to slide as the tree limb grows and moves beneath the platform. So here is the pilot hole in the limb. And here is the lag bolt installed. Here is what it looks like from underneath with the platform on top of the lag bolt gate hinge. You can see how the platform is just sitting on top and can slide past as the tree moves. Of course, I need to keep my eye on this over the years because if the tree moves too much I may need to move the lag bolt or add another one in a different location. Now the next part is trickier. The platform is pretty darn heavy so I’m not terribly worried that it will blow away in a wind storm. But since it is mounted on top of a sliding surface, I don’t really want it moving over time and sliding off or becoming way off center. So I picked one single attachment point and allowed it to pivot at this point by using a lag bolt with an eye. Technically this is pinning the platform to the limb, but only one out of the four touching points is pinned, so it won’t bind. 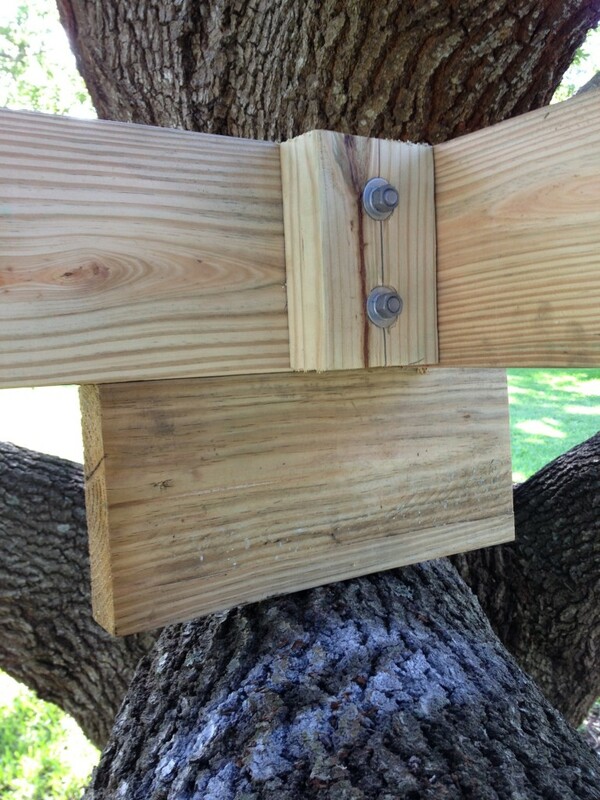 This pin will pull one corner of the platform along with the growing tree limb and the rest of the platform will slide along the lag bolt gate hinges. 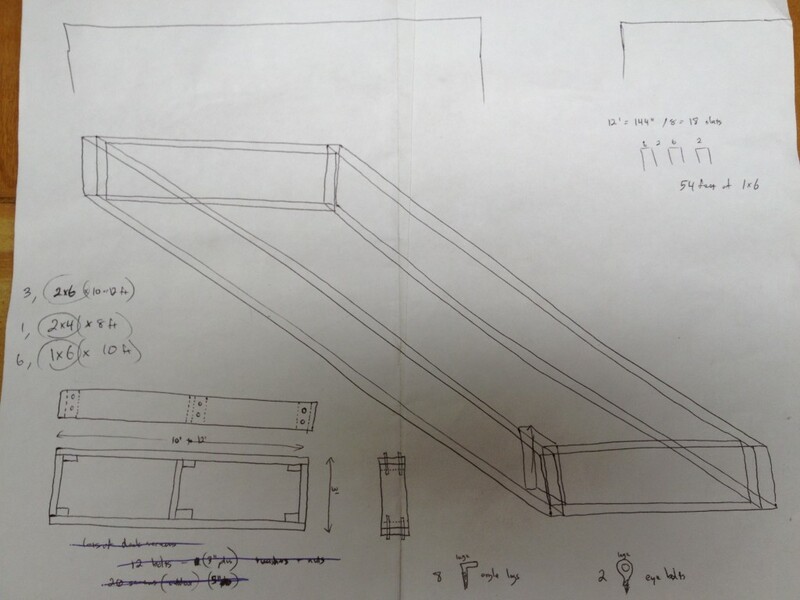 And the fact that this pinned joint is hinged will allow the platform to rotate a little bit in case one limb grows up or down relative to the other limb. 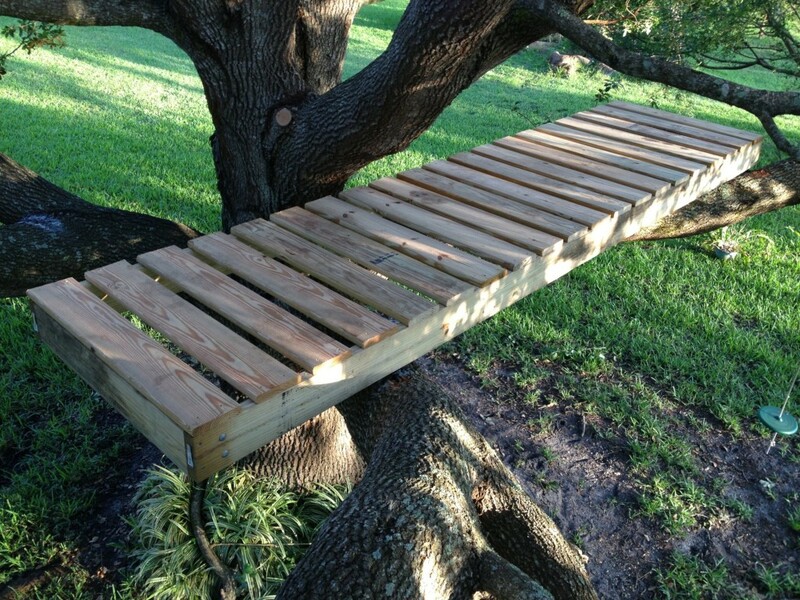 After cutting and installing the 1×6 deck boards, the project is complete. I purposely left a pretty good sized gap between the deck boards. The large gap helps keep leaves from piling up. Also, psychologically I think it helps remind the kids that they are not standing on safe ground and that they need to be extra cautious up there. I also think the lack of railing up there makes them extra cautious. Here is the reverse angle photo. The platform is 12 feet long and 3 feet wide. I considered making it 4 feet wide, but the limbs at that point start to turn upwards pretty sharply, so 3 feet was a good compromise to keep the platform relatively level and a decent size. And finally, here is what it looks like from the ground. I wanted it to stick out past the tree limbs so the kids could sit up there with their legs dangling over, like sitting on a dock in a lake or something. Thanks for your interest! Please use the “email us” link or leave a comment below if you have any comments or feedback or any other ideas! Click here for the web page that details this project.